This week’s indigenous varieties is Canaiolo Bianco. It is less well-known than its’ relative Canaiolo Nero but it can be an important variety in the wines of Orvieto DOC. 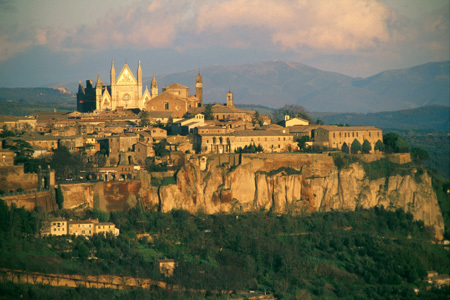 Wines from Orvieto have been famous for centuries, almost as famous as the beautiful cathedral. In earlier times, the wines from Orvieto were mainly sweet but for many years, a dry wine has been made. Canaiolo Bianco in Umbria is known as Drupeggio. It also grows in Tuscany. In both regions, it is a white blending grape. In Umbria, it is paired with Trebbiano and Grechetto and in Tuscany, it is blended with Trebbiano and Malvasia.